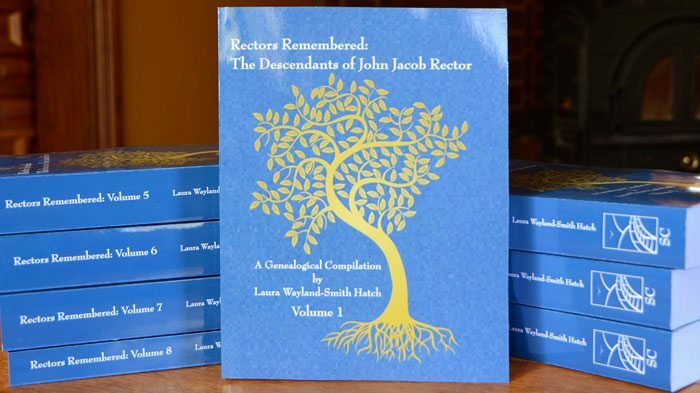 Thank you to Laura Wayland-Smith Hatch, who announced that she is donating her recently released genealogical compilation, “Rectors Remembered” to the Germanna Foundation. The compilation reflects almost 10 years of work and consists of 8 volumes and more than 5,000 pages. Laura’s work is available on Amazon, and we’re sure that Rector descendants will find it to be of value. The Foundation expects to add it to our library collection at the Visitor Center within a few weeks. Thank you, Laura! A genealogical compilation of the descendants of John Jacob Rector and his wife, Anna Elizabeth Fischbach. Married in 1711 in Trupbach, Germany, the couple immigrated to the Germanna Colony in Virginia in 1714. Eight volumes document the lives of over 45,000 individuals.